Receive our love and warmest greetings in the name of Jesus Christ. We praise God for his grace and daily provision as we work with you in partnership to bring transformation in all areas of the lives of God’s people in the Diocese of Muhabura. We hope that the Christmas season was a great blessing in your lives. We enjoyed it as well and praise God for it. In Uganda, Christmas is much celebrated; everyone returns home to visit their family and many gifts are given. There is much celebration, and on Christmas day everyone has a feast. We wish you a prosperous and blessed New Year in 2019 and pray that God will bestow more blessings upon you. Finally, allow us to take this opportunity to thank God for Tearfund’s new Country Representative in Uganda, Paul Ojuman. We greatly look forward to working with him in the coming years and continuing the work that we started with previous Country Representative, Tim Raby. WATSAN stands for Water and Sanitation. At the end of 2018 we held our biannual Diocesan Leadership Meeting, to assess and evaluate the success of the Church and Community Mobilisation(CCM) project over the last six months. Twenty diocesan leaders met together and project staff presented them with a progress report which included the project’s goals and objectives, together with the core activities that the project has accomplished. The team also spent time sharing their achievements and the challenges they are facing. Then the meeting decided on a way forward for the continued success of the project. The project team were encouraged by the meeting, as the Diocesan leadership approved of CCM as an important tool for transforming people’s lives. They’ve promised continued support for the project until transformation is evident across the whole Diocese. December is often a quiet time of the year, with many people preparing for Christmas and visiting family, but we have still been active. During the period the CCM program carried out a group reflection, with church facilitators considering the Relationship Building bible studies. The aim of this was to assess how effective the bible studies have been in transforming the relationships of people in the local church and surrounding community. Participants shared the successes and the challenges they’ve encountered in a friendly and supportive environment. Then the group discussed and agreed on new ideas for facilitating bible studies with an aim to spur on the process. Our WATSAN programme has helped communities build seven new rainwater collection tanks across the Diocese since July. This brings the total number of tanks built through the programme up to 222 since 2014. The table below shows what tanks were built and the communities they were built in. We train local builders in the techniques they will need to build the tanks – giving them skills that they can use in years to come. But our work does not stop here. We help the local community assess who is most in need of the water tanks, so that they decide where each tank is built. This is because we realise that they are the people with the best knowledge for making these decisions. Once they have done this, we help communities supply the materials they will need to build the tanks. Very often this is easier than people realise. Some may have a sandy area on their land or the village may know somewhere they can quarry rock. Others will raise money to buy materials like corrugated iron which are not found on their land. It means that we can help build more tanks. When communities contribute towards the costs of the tanks, we don’t have to spend as much in each community and our budget can go further. 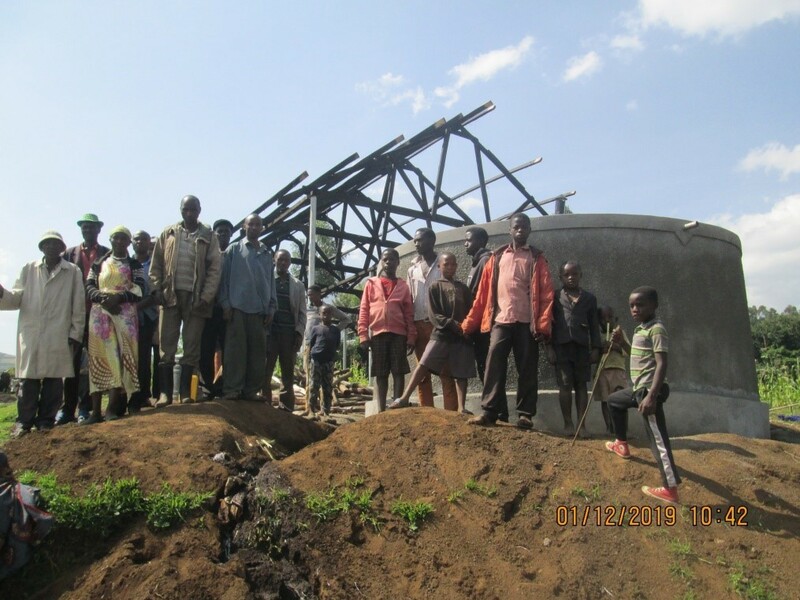 Encouraging communities to supply building materials helps increase their ownership of the tanks and shows them what they can achieve. In early October 2018, the Diocesan CCM and WATSAN Officers took part in the Tearfund Partners annual meeting that was held over three days in Soroti. This was a key time where we could get together with other Tearfund partners to share the successes and achievements. It gave us the chance to discuss and understand Tearfund’s country strategy for Uganda. It was an opportunity for us to say farewell to Tearfund’s outgoing Country Representative, Tim Raby, and welcome new Country Representative, Paul Ojuman. The conference included a handover ceremony where they exchanged instruments of power and words of wisdom with participants. My name is Frank, I live with my wife Rita and our four children in Busamba Village, Kisoro District. 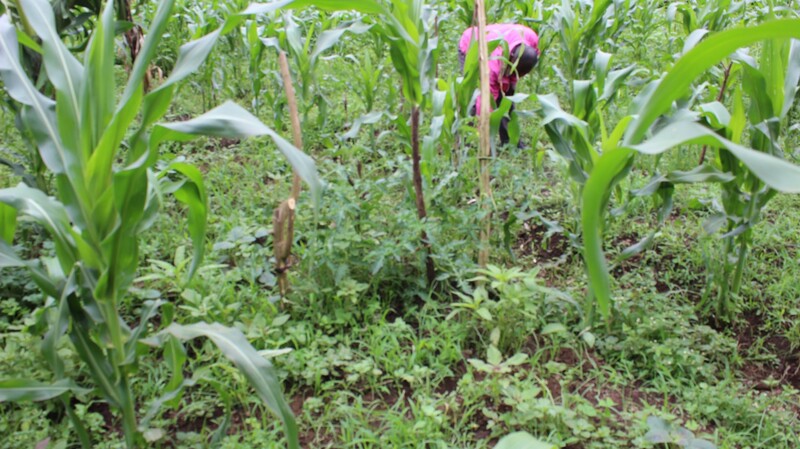 We go to one of the churches in Kisoro who are taking part in the CCM project, and I want to tell you how my life has changed because of it. Since it was introduced in our church, CCM has contributed much to my life through the workshops and bible studies. When our church started CCM, I was chosen to be a facilitator, and there has been significant growth in my spiritual life. Before CCM, my spiritual life lacked much; for one thing, my marriage with Rita had not been officially registered in church. But through this process, my life has been transformed and we have officially registered our marriage. I am very happy for what God has done. Now, I share God’s word in church while leading the CCM bible studies, and I am an active participant in the local Father’s Union. This never happened before. What’s more, my financial situation has improved too. The knowledge and skills I have learned through the CCM training have helped me to overcome worldly challenges using scripture. They are also helping me guide others people looking for transformation. I have tried to set an example by living the life of a transformed person in my community. I started a project raising chickens which boosted my income. I am using a technique called Farming God’s Way in my garden to improve my crops of maize and passion fruit too. I never thought I would be able to change my income in this way. I am sincerely grateful to the Diocese of Muhabura for introducing CCM to our church as it has greatly changed my spiritual and material life. I hope that God in his mercy will allow the projects started thanks to CCM, and the transformation in our community to continue, fulfilling God’s purpose for us all. Ndago is a small community in the parish of Gasovu to the south of Kisoro town. This area is part of the highlands at the base of Mountain Muhavura. 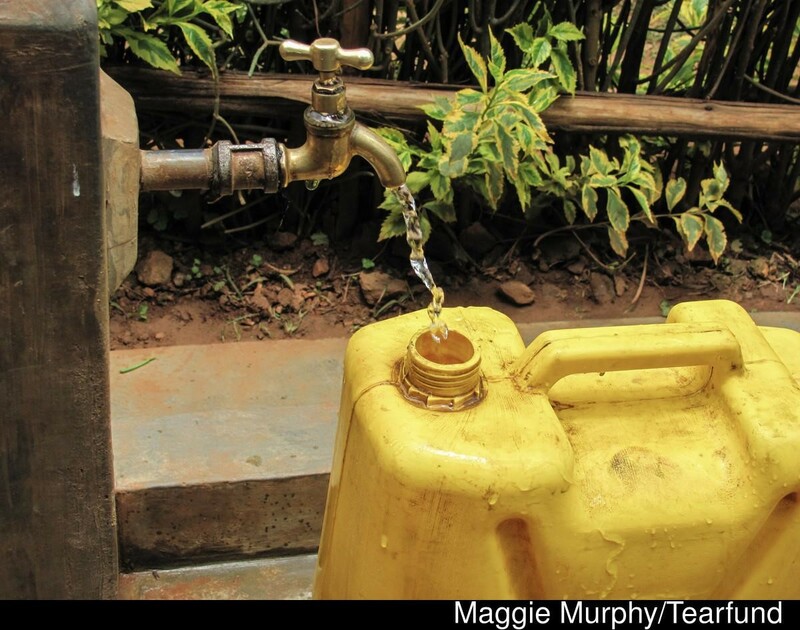 For many years, getting access to clean water was a serious problem for the people of Ndago. Water was scarce, and many people suffered from diseases due to drinking dirty water. Living high on a plateau, there were no natural springs or ground water they could tap into and the community’s closest tap stand was two kilometres away. While they waited to be included in a local clean water programme, community members tried different solutions for their lack of clean water. Some tried collecting rainwater in ditches lined with tarpaulin. Unfortunately these did not collect enough, and sitting in the ditches made the water dirty. But the situation changed when Ndago was accepted onto the Diocesan WATSAN project. The plan was to build a large 20,000 litre tank that would serve the whole community. To supply the tank with water, the village would have to build a large roof shade that the builders could use to catch the water and channel it into the tank. Motivated by the prospect of clean water in their village, the community sprang into action. Members began raising money to buy a plot of land for the communal tank, at the same time, they began gathering building materials, like stone or sand from their land, some money ready to use in the project, while others contacted local politicians to ask for assistance with funding. Today the community are so pleased and grateful to have their new tank. They are seeing the difference in day to day life and have renewed hope and confidence because they have seen a major challenge for their community solved. Pray that God will provide abundant grace to all Christians in Muhabura in 2019. That they will open their eyes to understand fully his purposes for them. Pray that people in churches implementing CCM will continue to have a spirit of teamwork, so as to achieve the transformation they seek, both spiritually and materially. Pray that communities will be able to gather sufficient resources so they can begin building new tanks. Pray for Tearfund’s new Country Representative, Paul Ojuman as he settles into his new role. Pray that the process is smooth and that he is able to build new relationships quickly. Pray that all Diocese of Muhabura programme staff stay healthy – and actively involved in the programmes – so that we can complete all the activities we have set out to do.